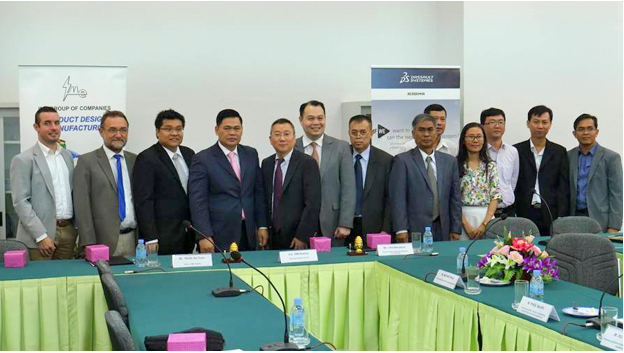 Phnom Penh, CAMBODIA — April 25, 2016 — A strategic partnership was formed between Dassault Systèmes, Institute of Technology Cambodia (ITC) and IME Trading Sdn Bhd (IME) today to transform engineering learning experiences and skill development for students in Cambodia. The objective of this partnership is to build a sustainable pipeline of engineering talents with high quality innovative education system. With this partnership, ITC will set up a center of excellence focusing on providing courses on digital design, electrical design, construction industry and education practices based on Dassault Systèmes SOLIDWORKS curriculum programmes. IME will support the initiative by providing training for the lecturers as well as relevant hands-on experience for an all-rounded engineering education. The training will also include exposure to project management opportunities to increase students’ industry relevance and ultimately, help to increase employability. “We believe education forms the bedrock of any economy and we are delighted to partner with ITC for Cambodia. This partnership is a reflection of our commitment to engineering education in Cambodia by providing access to tools and activities that are recognized by industries around the world,” said Benjamin Tan, Director of Professional Channel, AP South, Dassault Systèmes. Since its inception in 1964, ITC has established itself as the leading institution providing high quality education in the fields of engineering sciences and technologies in Cambodia. With its education partners in Cambodia and globally, ITC plays a pivotal role in promoting innovative education and supplying skilled workforce for integration and evolution of the labour market in Cambodia. Through this partnership, teachers and students at ITC will be offered a specialized suite of tools for engineering design, documentation, simulation and sustainable design in one easy-to-learn software package. In addition, students will have access to 3D CAD, simulation, product data management, technical communication and electrical design tools for hands-on product design training. “There is always this gap between education and industry, where education fails to meet the demand of fast changing industrial demands. By partnering Dassault Systèmes, we hope to narrow the gap between classroom and actual workplace by integrating digital technologies such as virtual environment learning on real industrial projects. Through such programmes, students will be able to differentiate themselves with the right skillsets and the relevant industry experience,” said Dr Om Romny, Director General of ITC. “We are delighted to be part of this ambitious partnership. With 36 years in the industry and the long-term academia partnership with Dassault Systemes, we are confident in leading the teachers and students through the intellectual rigor that is required to fully harness the potential in the classroom and compete in the marketplace,” said Julia Wee, CEO of IME. The discussion of this partnership started in August 2015 when Gian Paolo BASSI, CEO of SOLIDWORKS, Dassault Systemes, visited Cambodia and hosted its first Professional Channel Partner Conference for AP South in Phnom Penh. The MoU signing ceremony took place in ITC campus today.